Nature’s Sunshine Echinacea/Golden Seal Liquid Herb provides powerful immune system support. A 5 ml serving contains 125 mg of two echinacea species and another 125 mg of golden seal root. 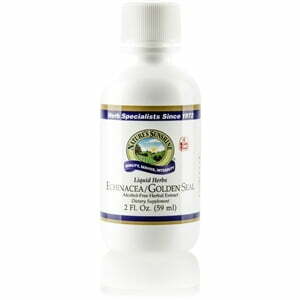 Both children and adults can benefit from the glycerin based Echinacea/Golden Seal Liquid Herb formula. Instructions: Adults: Take approximately 15-20 drops (1 ml) in water with a meal three times daily. Children: Take approximately 5-10 drops (0.5 ml) in water with a meal three times daily. A natural and pure extract composed of the finest echinacea root (Echinacea purpurea and angustifolia) and golden seal root (Hydrastis canadensis) in vegetable glycerin. This highly concentrated liquid herb may be used by adults and children.